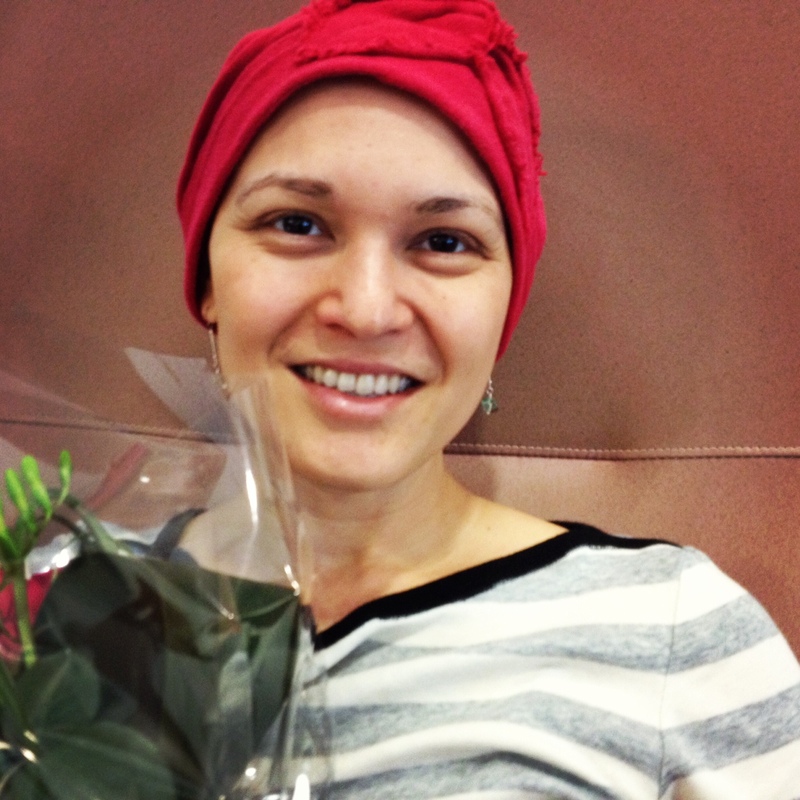 In the chemo chair with my flowers from Nurse Shelley. Ready for my last treatment. “A small amount of faint residual non-mass enhancement [in the breast] is identified measuring approximately 1cm. No suspicious mass enhancement is identified in this area. Overall there has been significant improvement in the enhancement noted in the upper outer quadrant of the left breast. The previously noted mass measuring approximately 15cm in greatest dimension. That is a whole lot of words that basically make me cry happy tears. And it’s been a long time since I cried happy tears. I have a CT scan next that will also provide more info, particularly about the tumours that were in the neck area. The MRI was only for the breast and under my arm. Also, today was my last chemo treatment! All went well. 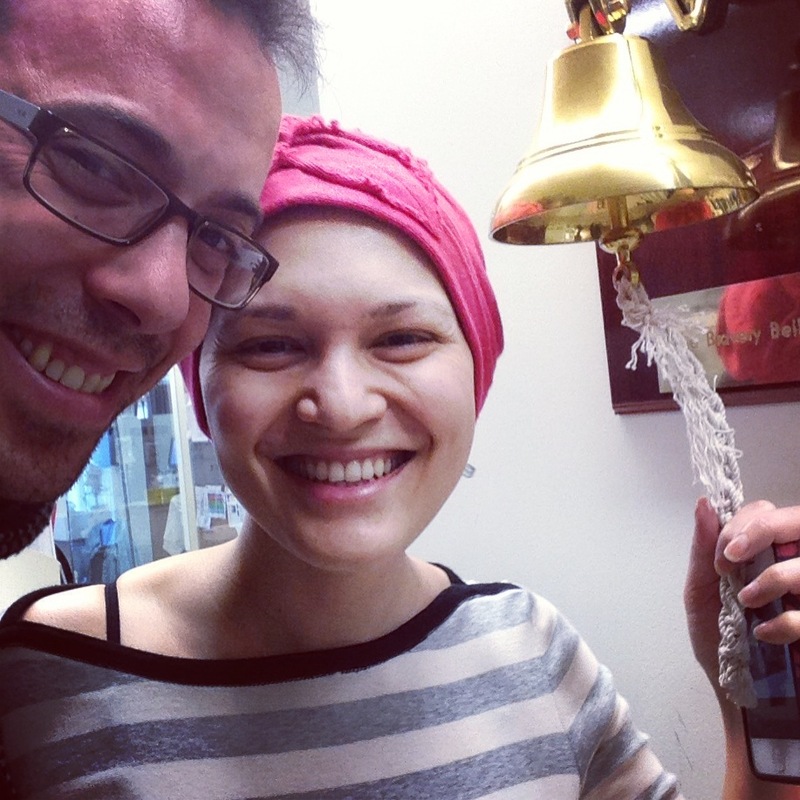 At Princess Margaret, when someone finishes chemo, they get to ring the “bravery bell.” I felt a bit wonky and tired as I walked over to it, but once I got my hand on the rope to ring that little bell, I was surprisingly awake. Ringing that bell felt awesome. It made me feel invigorated and, for lack of a better word, alive. Everyone nearby started clapping, and again, I cried a few happy tears. This may be the only photo where I do not have a crazy, maniacal smile on my face. I loved ringing that bell! I know the next few days will be up and down, but knowing that this is the last time I have to deal with all the chemo-related side effects makes me feel strong and so, so ready to be done with all of this. The next step is surgery, which will also be hard, but that’s okay. I keep telling myself this little mantra: The only way out is through. And it makes me feel better and ready for whatever comes next. 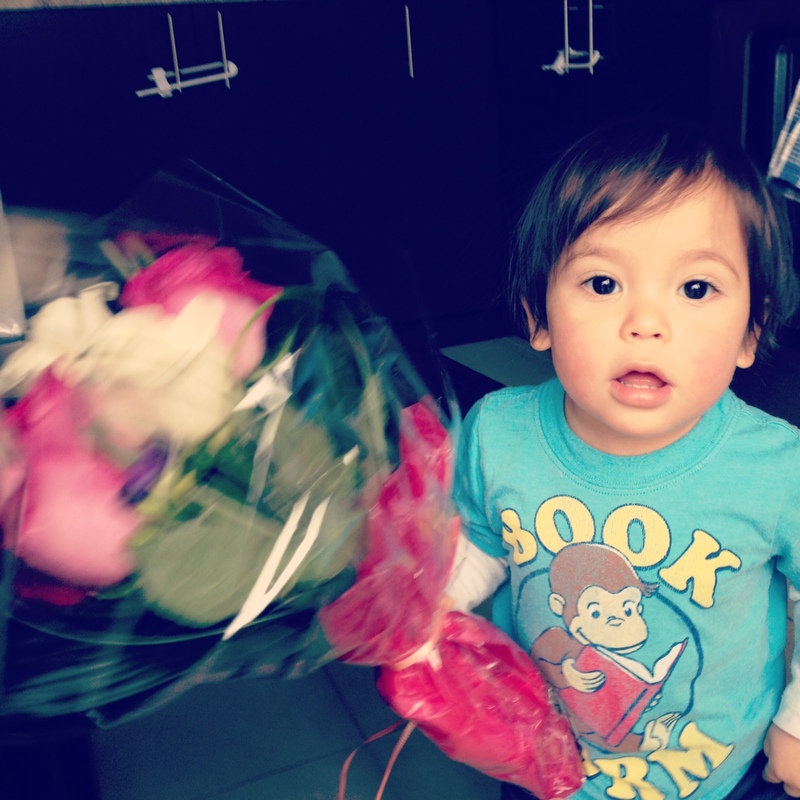 Nate with my post-chemo celebratory flowers. This entry was posted in Uncategorized and tagged breast cancer, chemotherapy, happy tears, last chemo, motherhood, MRI. Bookmark the permalink. YAY! So happy! Tears of joy over here too! LOVE! Definitely happy tears happening everywhere! What wonderful, superb news! I think we all have happy tears for you, mitch and nate! YAY!!! That’s wonderful Naomi. Lots of love from Portland, and from the Levy clan (and Katy’s family!) all over the West coast. So much to be grateful for thanks to this post. Happy, teary day. Sending my biggest hugs to all of you. Way to go! Only happy tears from now on! Awesome, awesome, awesome! Can’t stop looking at this and happy-crying! I know the next week will be tough, but you will be OUT soon! Sending SO MUCH LOVE! That’s awesome!! So happy for you! This is fantastic news!!! Prayer warriors at work!!! Hope you find strength in Mitch and Nate for the next few days!! Surgery is in God’s hands, and you will be ok!! Be strong Naomi, GO Naomi. my favorite post so far. love you sis. You’re bravery is so inspiring, Naomi! Ring that bell! So happy for the positive news and sending lots and lots of love your way. Wishing you strength and peace for whatever’s next. Oh wow – absolutely bawling my eyes out right now – all happy bawling of course. This is so incredible to read. Love you so so so so much. Such good news! Words can’t describe how wonderful this post is. Happy tears indeed 🙂 Ring the bell, ding ding!! You are a champion Naomi, and so are you Mitchymitch. You are both so impressive. Really looking forward seeing you and young Nathan in May. Love you guys! Oh Naomi, I have been thinking of you this past week and beyond thrilled to hear your wonderful wonderful news. Beautiful photos of a beautiful family- what a moment to ring that bell and move ahead! You, Mitch and Nate are truly together in overcoming this and you are doing it one step at a time- we are so proud and inspired by you all! p.s. Glad Nate is enjoying swim class- a pool play date with his pal Clementine this summer will be super cute!